Hello again friends and fiends! Tayla here, and today I am bringing to you one of my favourite bands of the moment and also the winner of this month's Band Of The Month crown: November-7. Hailing from Neuchâtel, Switzerland, November-7 are: Annamaria Cozza on vocals, Stéphane Geiser and Matt Walters on guitars, Emmi Lichtenbahn on bass and Yann Siegenthaler on drums. The band formed in 2005 and have since released two EPs, two live DVDs and have recently put out the follow up to 2011's debut Season 3. The band's second album Awaraxid 7mg has an interesting medical concept surrounding it. In order to communicate the medical concept the band released 5 short videos introducing the scientists behind the projects and the reasons why they decided to launch the drug. All 5 videos can be viewed on the band's youtube. The band's website slates the new album as “pure November-7”, and goes on to say: “it embraces melodies and martial sounds, fusing catchy choruses, fat and obsessive guitars and industrial samples.” They certainly prove themselves with the lead track from the album Another Day, which brings together the effects of Awaraxid 7mg both good and bad in a staged scenario between two main characters. Why not see for yourself? Eheh, almost didn’t make it in time this month. And our March Band of the Month is Lacuna Coil. Why them? They’ve got an album soon to be released (it’s tomorrow people) and I’ll quote our lovely Tayla "They're amazing. Period. ", that was enough for me. So let’s start with a bit of history, I know how much you love that. In 1997, the band Ethereal sent a demo tape (for the younger one, that the thing we used before CD) to several labels across Europe, and it was with the independant (someone will have to explain what that word mean now) label Century Media Records that they decided to sign. Unfortunately for them, the name Ethereal was already use, therefore, they decided to change, and in 1998, Lacuna Coil was born. (Lacuna Coil being a mix of english and italian than can be translate as “empty spiral”) 1999 saw the release of their first album In a Reverie and a few tour as main support for Grip Inc. and Lacrimosa. Then a second album, named Unleashed Memories, in 2001 and a third one, Comalies; just a year after. In the few years after, the band tour quite a bit, do a music video and even appear on MTV Italy (and a few other channel). Then Karmacode is released in 2006, during this year, they also have the pleasure to support Rob Zombie during a sold out tour, which had Bullet For My Valentine has opening band and participate in some of the biggest rock and metal festival of Europe (Download, Rocm Am Ring…). The year after, the band has the chance to play at the Milan’s release party of the videogame Guitar Hero 3 which include their song Closer. Not long after, the band give to the world their first dvd Visual Karma (Body, Mind and Soul). Shallow Life and Manifesto of Lacuna Coil appear on the shelves in 2009, during the same year, one of their song The Last Goodbye is used in the OST of the movie Saw 6 and their music video for Spellbound won the award for best editing. We, then, have to wait 3 years before the release of their next album Adrenaline, the same year, they participate in the Gigantour with Megadeth and Motorhead. Then come 2014 with good and bad news, indeed, Cris 'Pizza' Migliore and Cristiano 'CriZ' Mozzati decided to retire from the band, leaving them without a drummer and only one guitar, but this year will also see the release of a brand new album name Broken Crown Halo that’s gonna be release tomorrow, so get ready! There you go, now you know the big lines about the band (and I’m pretty sure that if you find that not enough, you’ll search ‘till you are satisfied), as you can see, they have been quite active. When they were not working on an album, they were touring and making video for your enjoyment. They already made 7 albums in 16 years, nearly one every 2 years, which is, in my opinion, a bit impressive since the quality is always there. Therefore, don’t forget to get your hands on Broken Crown Halo as soon as possible, it's released in a few hours and I’m pretty sure you won’t regret it! This month, we’re going to Canada with our featured band! Why? Well, because why not? Who don’t like Canada with its unbelievably nice and polite inhabitants. And this time, we go to Ontario, since I’m awful at geography, you’ll have to ask our Canadian expert (aka Tayla) for location because I would have difficulty finding my own place on a map. So, this month we chose the trio of Chelsea Pisano, Brandon Iajecznyk and Thomas Collier that form the band that is Embracing Soul. So, who are they? Well, the band was formed in 2009 as a duo with Chelsea and Brandon, this two spent a year writing and recording their firsts songs. Soon after, Thomas joined them and Embracing Soul was ready to go on stage. 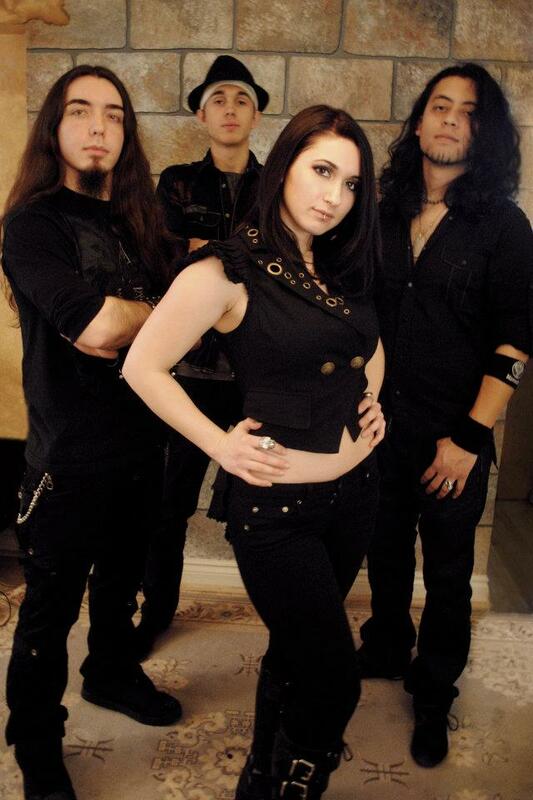 Early 2010 saw the release of their debut LP Shadow and only two years later, they released their first EP Luna under Illusive Records accompanied with a music video of the song Luna. As for now, they are working on new covers and material just for the pleasure of your ears. I discovered them on youtube where I saw Chelsea doing bass cover of Korn who then led me to see the bands cover and then their original song. (Quite a story, uh?) Therefore, I strongly encourage you to go on their channel watch and listen to them, you’re sure to have a good time!